A judge has said he would have to "recuse" himself from an alleged money laundering case due to involvement in a previous case with the accused. District Judge Nigel Broderick was speaking at Antrim Magistrates Court. John Gilligan, 66, of Greenforth Cresent, Dublin, was arrested while attempting to board a flight at Belfast International Airport in August. The National Crime Agency said officers recovered about 23,000 euros (£20,761) at the scene. On Tuesday, a prosecution lawyer said that a phone has to be examined in connection with the case and "international lines of inquiry" are to be pursued. A lawyer acting for Mr Gilligan, who appeared via video link, told the district judge that his client was seeking the shortest possible period of remand as he wanted to see momentum maintained in the case. The district judge said he was unable to deal with Mr Gilligan's case because he had been a partner in a firm that represented the accused in a previous case. As such, he said he was not going not rule on the application for a shorter remand. 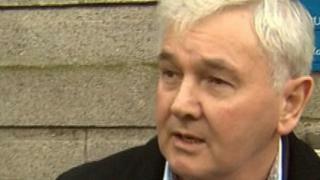 Mr Broderick told the court that he would ask a judge in Coleraine to deal with the case. It was adjourned for one week.